The accident that trapped the miners is not unusual in Chile and is the inevitable consequence of a ruthless economic system that has barely changed since the dictatorship of Gen. Augusto Pinochet. Copper is Chile’s gold, and the frequency of mining disasters keeps pace with prices and profits. There are, on average, 39 fatal accidents every year in Chile’s privatized mines. The San Jose mine, where the trapped men work, became so unsafe in 2007 it had to be closed – but not for long. On 30 July last, a labor department report warned again of “serious safety deficiencies,” but the minister took no action. Six days later, the men were entombed. For all the media circus at the rescue site, contemporary Chile is a country of the unspoken. At the Villa Grimaldi, in the suburbs of the capital Santiago, a sign says: “The forgotten past is full of memory.” This was the torture center where hundreds of people were murdered and disappeared for opposing the fascism that General Pinochet and his business allies brought to Chile. Its ghostly presence is overseen by the beauty of the Andes, and the man who unlocks the gate used to live nearby and remembers the screams. I was taken there one wintry morning in 2006 by Sara De Witt, who was imprisoned as a student activist and now lives in London. She was electrocuted and beaten, yet survived. Later, we drove to the home of Salvador Allende, the great democrat and reformer who perished when Pinochet seized power on 11 September 1973 – Latin America’s own 9/11. His house is a silent white building without a sign or a plaque. Everywhere, it seems, Allende’s name has been eliminated. Only in the lone memorial in the cemetery are the words engraved “Presidente de la Republica” as part of a remembrance of the “ejecutados Politicos”: those “executed for political reasons.” Allende died by his own hand while Pinochet bombed the presidential palace with British planes as the American ambassador watched. Today, Chile is a democracy, though many would dispute that, notably those in the barrios forced to scavenge for food and steal electricity. In 1990, Pinochet bequeathed a constitutionally compromised system as a condition of his retirement and the military’s withdrawal to the political shadows. This ensures that the broadly reformist parties, known as Concertacion, are permanently divided or drawn into legitimizing the economic designs of the heirs of the dictator. At the last election, the right-wing Coalition for Change, the creation of Pinochet’s ideologue Jaime Guzman, took power under President Sebastian Piñera. The bloody extinction of true democracy that began with the death of Allende was, by stealth, complete. Piñera is a billionaire who controls a slice of the mining, energy and retail industries. He made his fortune in the aftermath of Pinochet’s coup and during the free-market “experiments” of the zealots from the University of Chicago, known as the Chicago Boys. His brother and former business partner, Jose Piñera, a labor minister under Pinochet, privatized mining and state pensions and all but destroyed the trade unions. This was applauded in Washington as an “economic miracle,” a model of the new cult of neoliberalism that would sweep the continent and ensure control from the north. Today. Chile is critical to President Barack Obama’s rollback of the independent democracies in Ecuador, Bolivia and Venezuela. Piñera’s closest ally is Washington’s main man, Juan Manuel Santos, the new president of Colombia, home to seven US bases and an infamous human rights record familiar to Chileans who suffered under Pinochet’s terror. Post-Pinochet Chile has kept its own enduring abuses in shadow. The families still attempting to recover from the torture or disappearance of a loved one bear the prejudice of the state and employers. Those not silent are the Mapuche people, the only indigenous nation the Spanish conquistadors could not defeat. In the late 19th century, the European settlers of an independent Chile waged their racist War of Extermination against the Mapuche who were left as impoverished outsiders. During Allende’s thousand days in power, this began to change. Some Mapuche lands were returned and a debt of justice was recognized. Since then, a vicious, largely unreported war has been waged against the Mapuche. Forestry corporations have been allowed to take their land, and their resistance has been met with murders, disappearances and arbitrary prosecutions under “anti terrorism” laws enacted by the dictatorship. In their campaigns of civil disobedience, none of the Mapuche has harmed anyone. The mere accusation of a landowner or businessman that the Mapuche “might” trespass on their own ancestral lands is often enough for the police to charge them with offenses that lead to Kafkaesque trials with faceless witnesses and prison sentences of up to 20 years. They are, in effect, political prisoners. While the world rejoices at the spectacle of the miners’ rescue, 38 Mapuche hunger strikers have not been news. They are demanding an end to the Pinochet laws used against them, such as “terrorist arson,” and the justice of a real democracy. On 9 October, all but one of the hunger strikers ended their protest after 90 days without food. 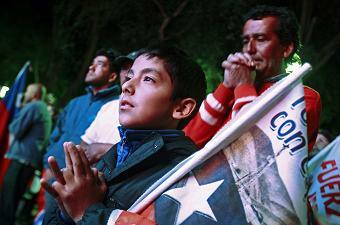 A young Mapuche, Luis Marileo, says he will go on. On 18 October, President Piñera is due to give a lecture on “current events” at the London School of Economics. He should be reminded of their ordeal and why.